Gretchen Rossi dared to go bare in a new selfie. 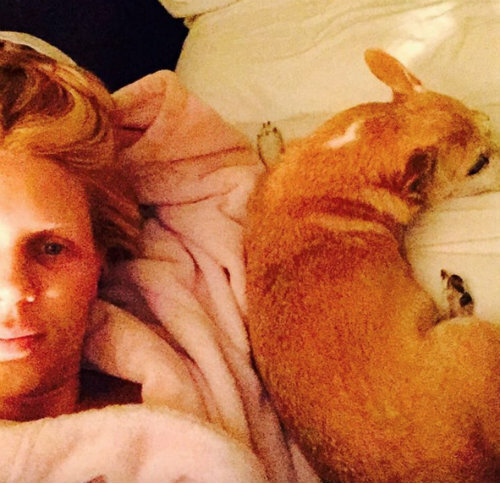 “My Happy Place at the end of the day; with my boys cuddled in bed, no makeup, ready for beauty sleep,” the former Real Housewives of Orange County star, 37, said of the picture. She added the hashtags #feelingblessed #lovemy4boys and #grateful. Although most people who commented were supportive of makeup-free picture, Gretchen told Us Weekly that isn’t usually the reaction she gets when she ditches her artificial lashes, eyeliner and lipstick. As for what else Gretchen’s been up to since leaving RHOC in 2013, she recently said she’s focused on expanding her Gretchen Christine Collection and spending quality time with fiance Slade Smiley.